The Cumberland & Dumfriesshire Farmers Mart P.L.C. had forward 1,018 store hoggs & 302 ewes & lambs, together with geld hoggs at their weekly sale at Longtown on Tuesday 6th April 2010. Store hoggs were short of requirements and sold to a top of £79.50 for Suffolks from Shaw of Dryffe. Texels £74.50 Shaw Cottage & Shaw of Dryffe. Hill Cheviots £70.50 Wardlaw; Greyfaces £68.50 Shaw Cottage; Blackfaces £56.50 Haithwaite, £55.50 Raby Grange; Swaledales £55.50 Chapel; Herdwicks £48.50 Rowhead. 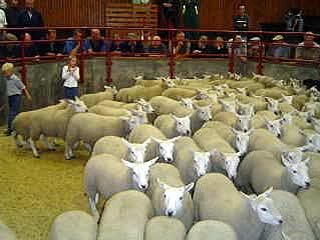 Cast ewes to £147 for Texels from Grayrigg; Cheviots to £64.50 Wardlaw. A good show of ewes with lambs at foot met a strong selling trade at high rates. Top was £62 for Greyface ewes with twins from The How & Raby Grange; Cheviots £47 East Middles. Ewes with singles to £62 for Greyfaces from Raby Grange, £60 The How; Cheviots £49 Raby Grange. Geld Texel hoggs to £94, £93 Grayrigg.